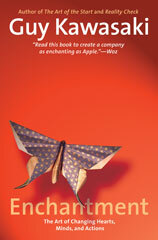 Enchantment: The Art of Changing Hearts, Minds, and Actions is Guy Kawasaki tenth book. In it, he explains how to influence what people will do while maintaining the highest standards of ethics. The next topics are launching, overcoming resistance, making enchantment endure, and using technology. There are even special chapters dedicated to enchanting your employees and your boss. Finally, because there are times you may want to resist enchantment, there’s even a chapter about how to do this too. To interact with the Enchantment community, go to the Enchantment Facebook page.